Playing the downside this morning, as the dollar has reached an important Fib target. But, watch for SPX to rebound at the bottom of its rising wedge — around 1590.72, which is also the .618 of the latest wave up. 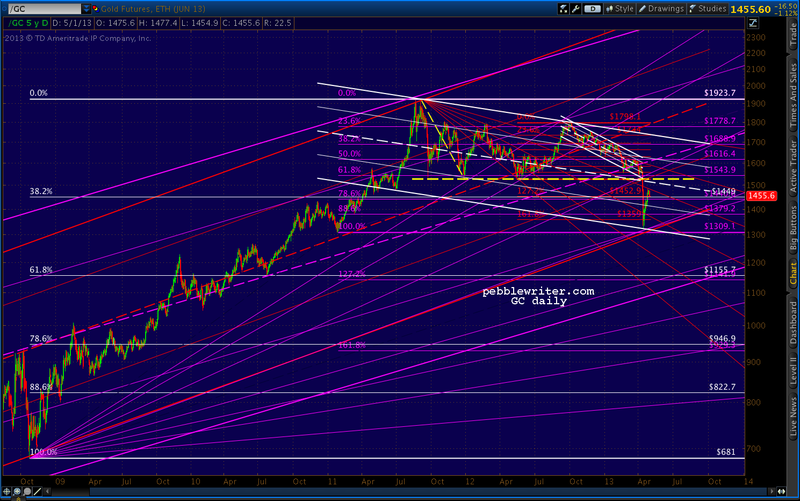 For those playing the bounce in gold, DX bottoming here means GC has probably topped out. 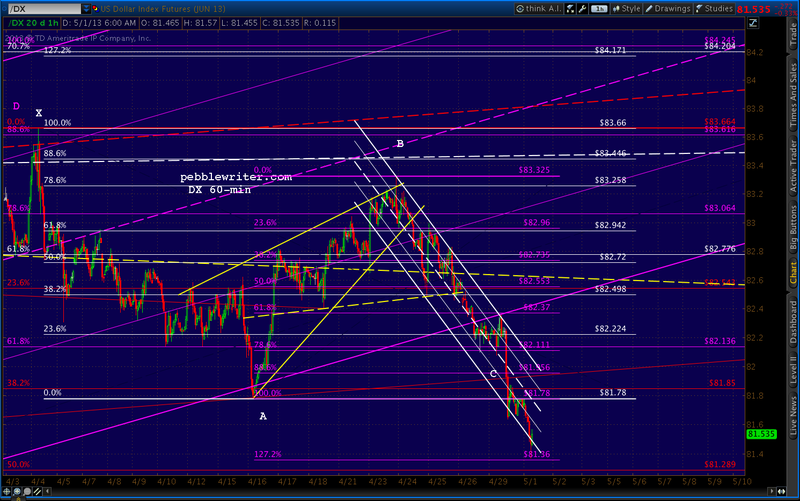 I’d switch back to short with relatively tight stops, targeting the previous lows and ultimately 1155. 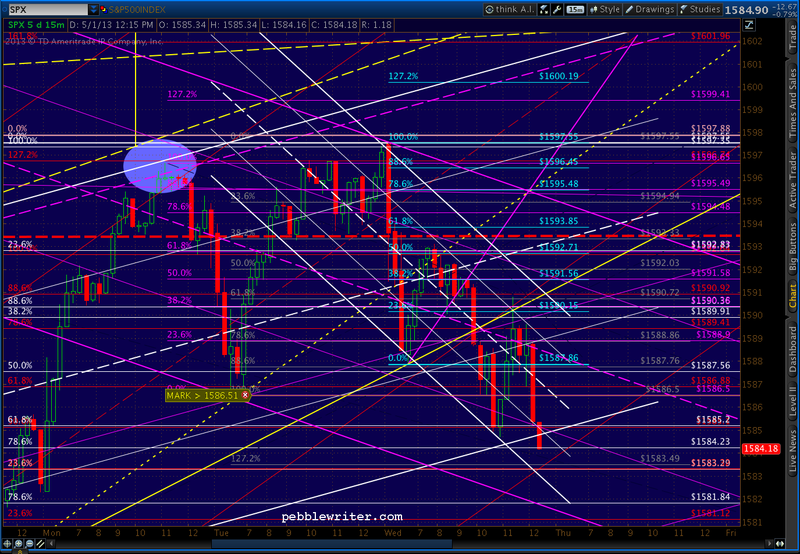 Just hit 1591.48 – not quite the .618 but a direct hit on the bottom of the wedge. Switching back to the long side with stops at 1590ish. But wait, you say, what about the dollar’s rebound? Glad you asked. It was a tag on the 1.272, and since we saw a reversal a little higher at the .786 it’s a legit Butterfly Pattern. 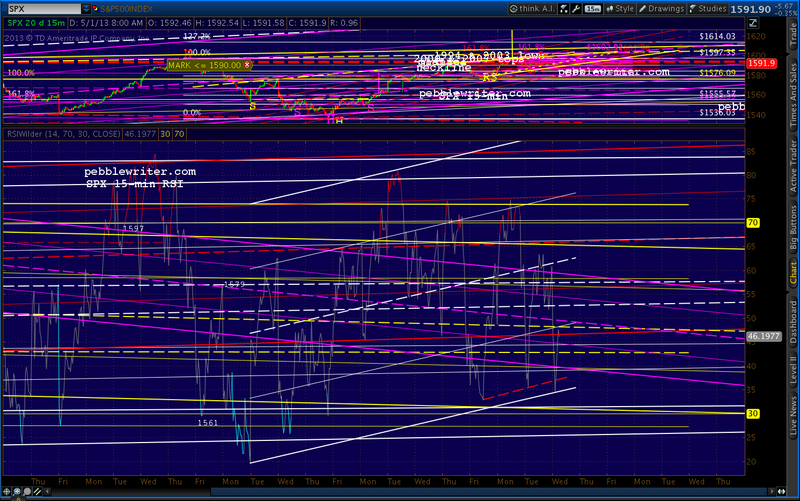 However, note that in reaching the 1.272, DX broke down from the purple channel that’s guided it higher since January. As such, the 1.272 is unlikely to stop the decline. Look to the 1.618 at 80.825 — also the scene of the red .618, white .500 and purple .382 — which would make it an equally legit Crab Pattern. That additional drop should be enough to help equities make the next push higher we discussed late yesterday. Just got stopped out of the long position so switching to short for the .886 at 1587.76. 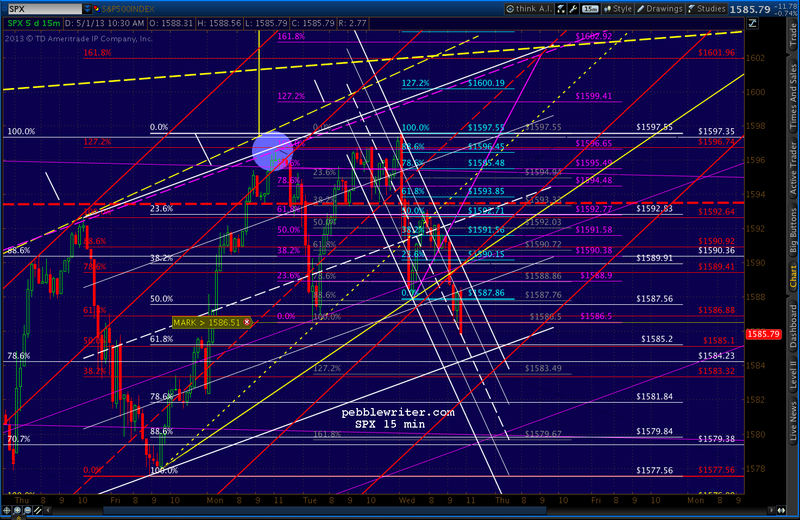 Stops at 1590ish again. Charts in a few. Close enough. 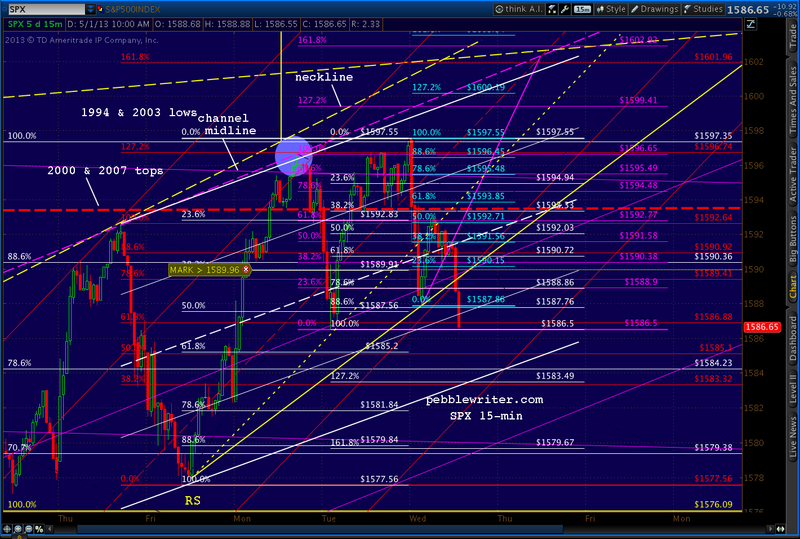 Back to the long side here, with stops around the 1587 channel line. Decent rebound so far. Should be out of the woods, but keep those stops where you’re comfortable. A break below 1587 would likely mean a downdraft to 1580 or lower. I’ll set stops there. 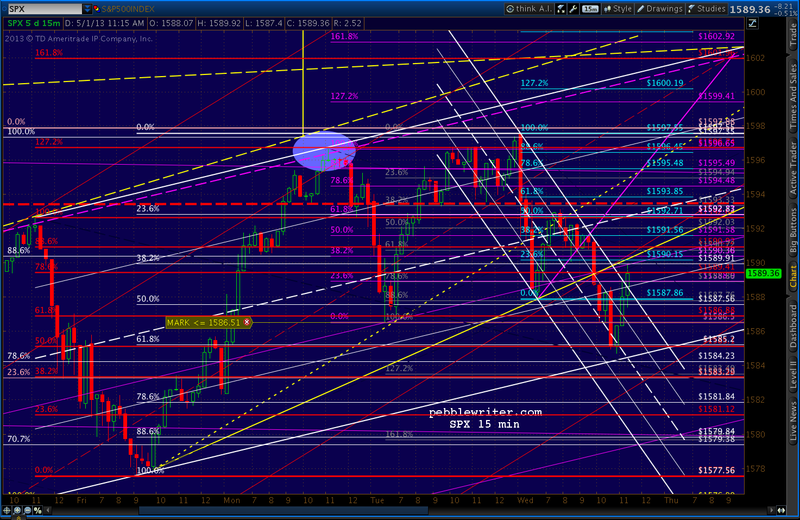 Next resistance on the upside, the TL from the 2000 & 2007 tops – the dashed red line at about 1593.40. BTW, we’re conditioned to think that a push lower such as we had this morning is bearish — a reminder of the risk in holding stocks. But, from a technical standpoint, that’s often not the case. 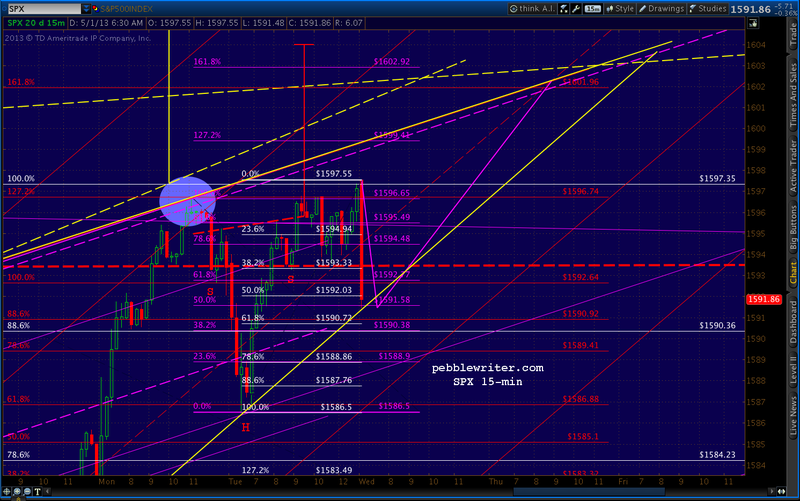 Note that the little rising wedge we were watching this morning (yellow, dotted) featured an apex around 1604 on Friday. In essence, it limits the upside and the time in which to reach it. If the 1587.86 low SPX just made holds, the new rising wedge apex is much further out in the future — and, at higher prices. RSI also gets reset with a move lower like this, clearing the way for more upside — if it’s in the cards. 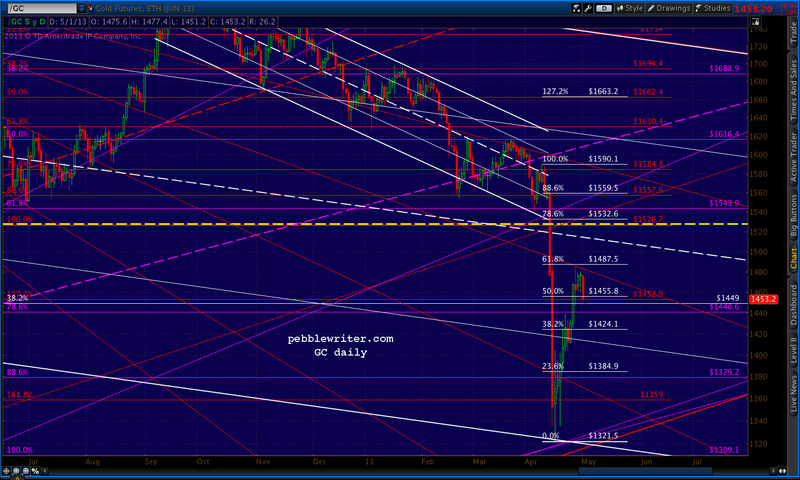 Even a move down to 1580 leaves a nice channel to the upside in place. Just means it would take a little longer to get there. Somehow, in this “random walk” down Wall Street, the marvelously efficient and unfettered SPX managed to stop one nickel above yesterday’s low of 1586.50. 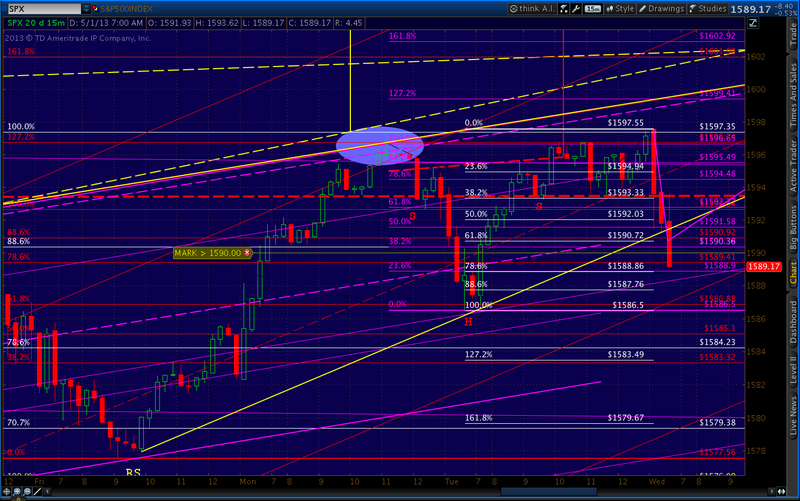 Since that was a 55%ish retracement of the 1577 – 1597 rise, a Bat Pattern is a good possibility. If so, the .886 is down at 1579.84. 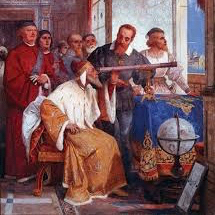 Note that this is also roughly the level of the 1.618 extension of the 1586 – 1597 rise — hence my earlier note that a drop through 1586 would likely result in 1580 or lower. Remember, 1586.50 is the key level. First support after that is the .618 of the 1577-1597 rally at 1585.20. So, use stops judiciously. After that, the .786 at 1581.84 and the .886 at 1579.84. 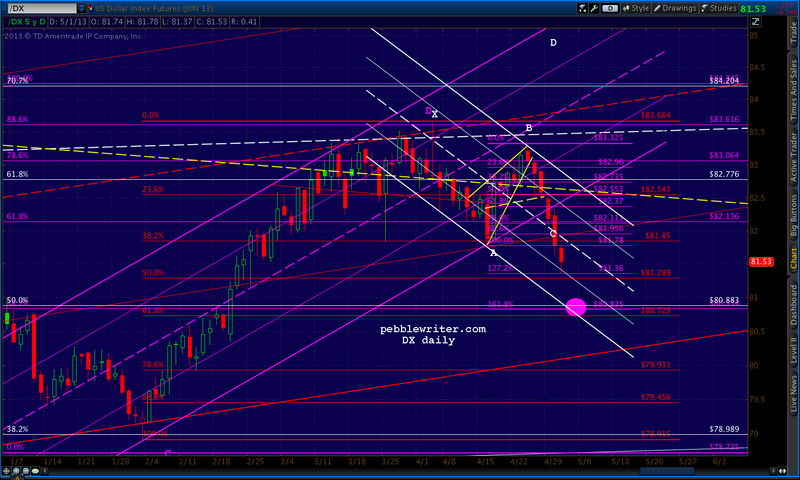 The .886 is the one that lines up with the most significant support: the .25 line of the purple channel from 1343. No change. Downside? Just kidding. Hmm… fiscal policy constraining growth. Continues to see downside risk. Could increase or reduce QE. One dissenting vote… Esther. 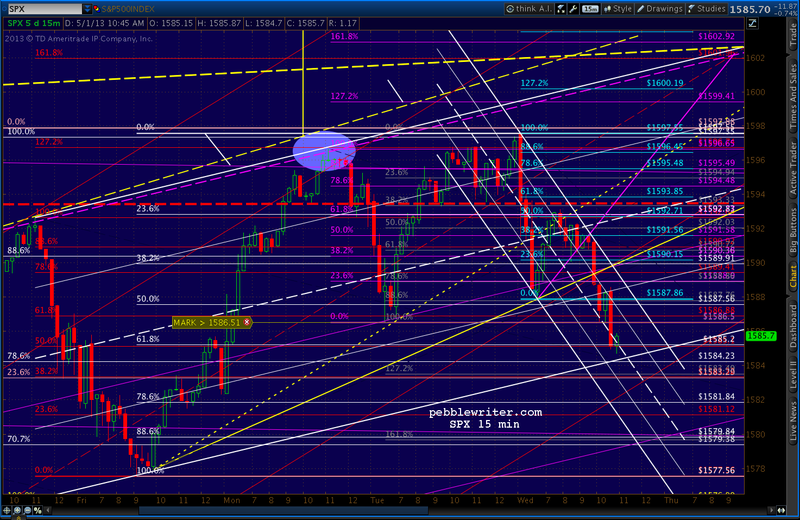 SPX broke out of the little falling channel and is back-testing the broken yellow TL. 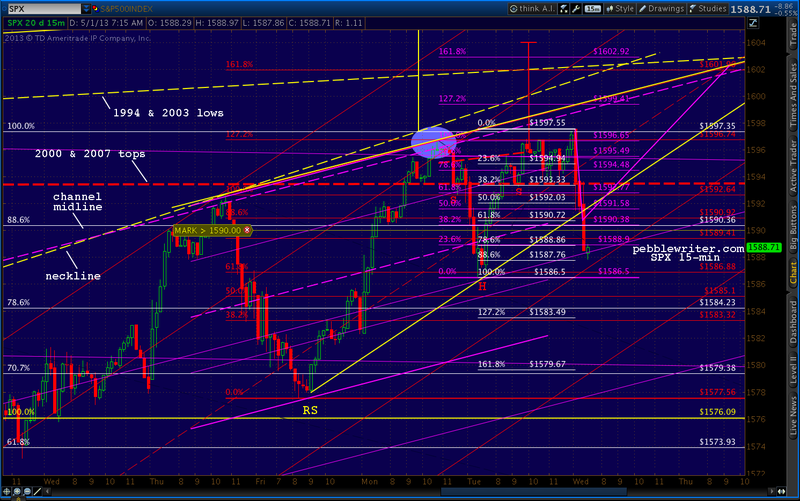 As before, a push through the last low (1584.70) opens up 1580. Trailing stops are a great idea. I’ll post an update asap, but have to grab a conf call first. 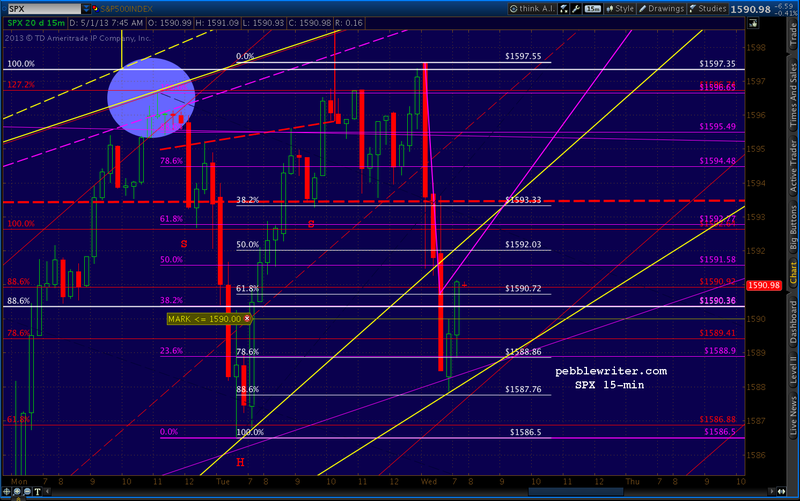 SPX just pushed below 1584.70. 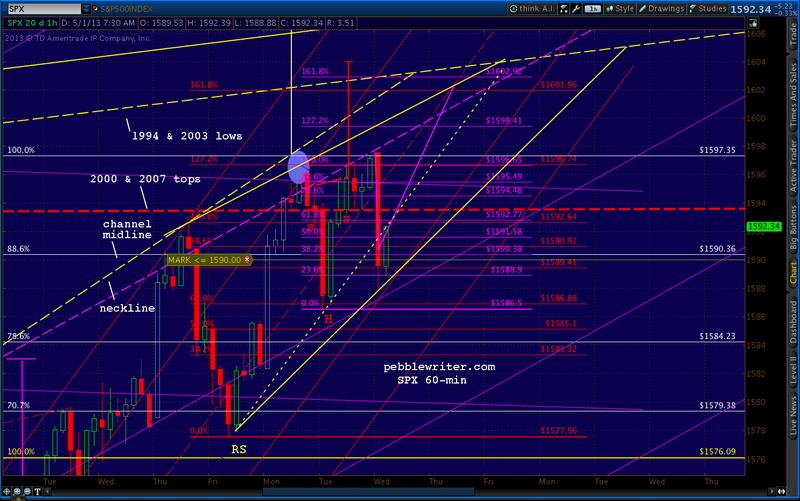 Back to the short side targeting 1580, with stops at 1586ish. Going to cash at the close. I suspect we’ll drop to 1579ish either in the closing minutes or in the morning, but either way it’s not worth the risk of the overnight position. I like when you give this heads-up, but can you try to give it a little earlier, maybe around 3:45-3:50? I would love to, but SPX was at 1581 at 12:45 and there was no way of knowing whether or not it would fall that last 1-2 points in the next 15 minutes. If it had, I might have gone into the close long. Since it didn’t, I had a choice of staying short overnight for the sake of 1-2 more points, or going to cash with 90% of the potential gains in hand. But, in the end, I tend to go with what I think is the most prudent course given the circumstances. Hi – for those of us who don’t mess with intraday stuff… PW, can you check out this premise? in your experience, what percent of time do these patterns complete? You’ve certainly an incredible track record on this! Hmm.. What you describe isn’t a Bat Pattern because C must be higher than A. Think of it as a big W with the second trough higher than the first. The points you mention DO form a measured move, where BC = .886 of XA. The white grid on the charts with 1597 as X and 1536 as A shows we had a sizable but brief reversal at the .707 and two smaller reversals at the .382 and .886. 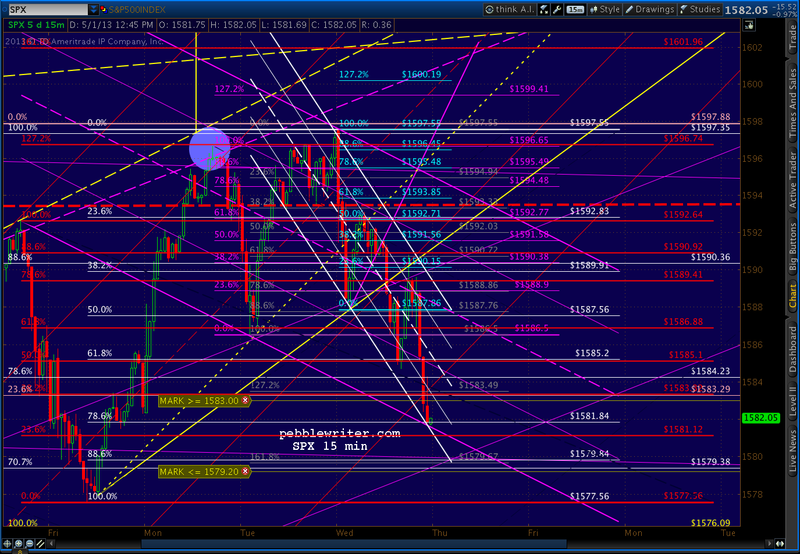 So, a Crab Pattern targeting 1635.10 is a possibility. Yesterday’s high topped the 4/11 high, so it’s officially on the table. I think harmonic patterns complete about 70% of the time. Hope that helps. Is that also true for Butterfly and Crab patterns? Pebble could you look at RUT appears to still be in a down trend and conforming today. Will update the RUT page after the close.